We might have seen this coming, given last year’s report from the Center on Budget and Policy Priorities. In that report, researchers laid out how 29 states, including North Carolina, continued to fund their public education systems below pre-recession levels. Now, with teachers in Kentucky, Oklahoma and West Virginia rallying over educator pay, left-leaning ThinkProgress says the states in question have more in common than the fact that they tend to vote for Republicans like President Donald Trump. They’re all so-called “right to work states,” meaning employers cannot require that workers join a labor union or pay dues. Whether teachers prefer to call them walkouts, work stoppages, or strikes, all of these states have a number of things in common. Yes, these states all went toDonald Trump in the presidential election — something many journalists and pundits have focused on. 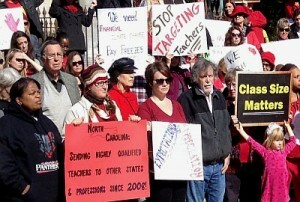 Of course, North Carolina has waged its own battles over teacher pay. And, to some extent, legislators have heard. 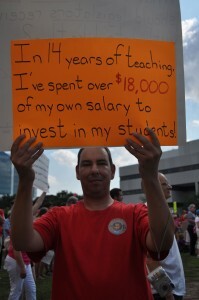 The General Assembly has approved modest raises in recent years, and, as a result, North Carolina’s average teacher pay ranking climbed to 35th in a 2017 report. But ThinkProgress goes on to detail how some states’ labor laws may be feeding the unrest.